8th February 2016 would be considered as a cursed day in the history of Facebook. 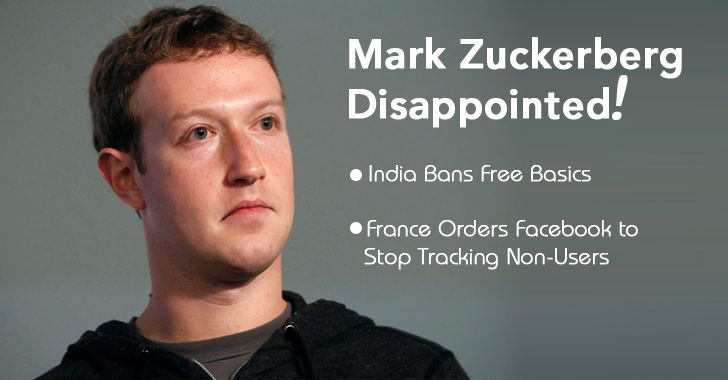 You might have known that just yesterday India bans Facebook's Free Basic Internet in the country. Now, Zuckerberg had got another bombshell in the form of a French Order from the European Data Protection Authority, who ordered Facebook to stop tracking non-users’ online activity and to stop data transfers of personal data to the US servers. Do you know: Facebook can still track you, even if you log out, with the help of its tracking cookies and plugins (like, share buttons) placed on any 3rd-party website. Facebook knows what sites you are visiting, and by "you," I mean specifically your account, not an anonymous Facebook user. As per the French Order, Facebook is not legalized to track the web browsing habits of all European citizens, even those without a Facebook account. The French Government had also provided a timestamp of 90 days to comply with the new law. French ruled that many big U.S technology companies including Facebook are violating the “Transatlantic Safe Harbour Pact” by infringing on Europeans’ rights to privacy. Transatlantic Safe Harbour Pact is an agreement between the U.S. and European Union that allows and regulates the way that U.S. companies could export and handle the personal data of European citizens. Last October the Safe Harbour was ruled illegal by the European court after Edward Snowden revelations, which was then extended for next few months to set up an alternative legal arrangement for transferring data while protecting the privacy of EU citizens. Meanwhile, the French data protection authority, the CNIL, claims that Facebook is saving a cookie of its non-users which allows them to figure out the common habits of its users - which ultimately leads to the violation of the French Privacy Law. "Facebook transfers personal data to the United States on the basis of Safe Harbour, although the Court of Justice of the European Union declared invalid such transfers in its ruling of October 6, 2015," the French CNIL said in a statement. French Authorities had said that it would act swiftly by charging a fine, if Facebook fails to comply with the law within 3 months. The New "EU-US Privacy Shield"
Just this month, 2nd February, EU and the United States agreed on an arrangement, called the EU-US Privacy Shield. The ‘Privacy Shield’ deal will control the transmission of data from the EU to the US while protecting European citizens’ private data from the US Mass surveillance. What could possibly go wrong with that? Share your thoughts in the comments below.